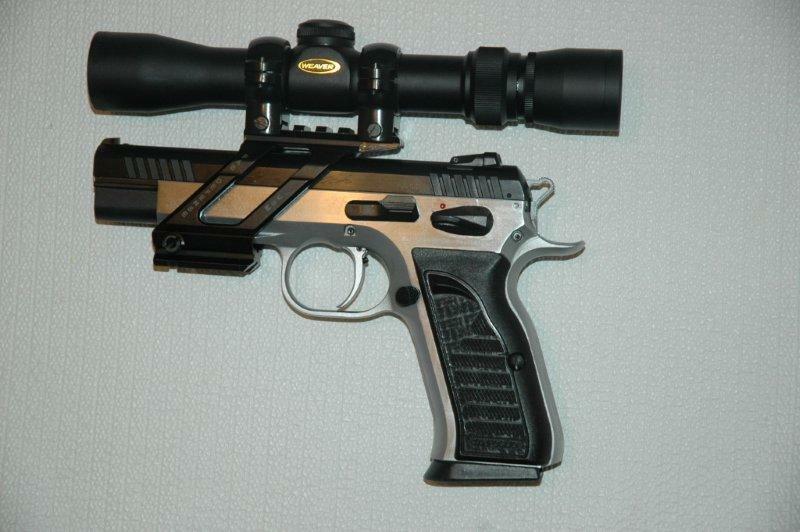 Why on Earth one would want to mount a scope on a pistol? There is a rational explanation. The scope, together with a shooting rest, considerably reduces the human impact on accuracy. How many times have you heard that a gun is "accurate", but when you ask what this means quantitatively the response would be - "well, it's more accurate than me". Unfortunately, since in most cases the capabilities of the shooter are unknown, it renders the original statement about the firearm devoid of any useful information. With the scope, the impact of the human is greatly reduced, and the innate accuracy of gun is on display. Bragging rights aside, where knowing the real accuracy is important is load development. Elimination of variability from the human factor allows much fewer shots to be made before suitability of the load can be deduced. 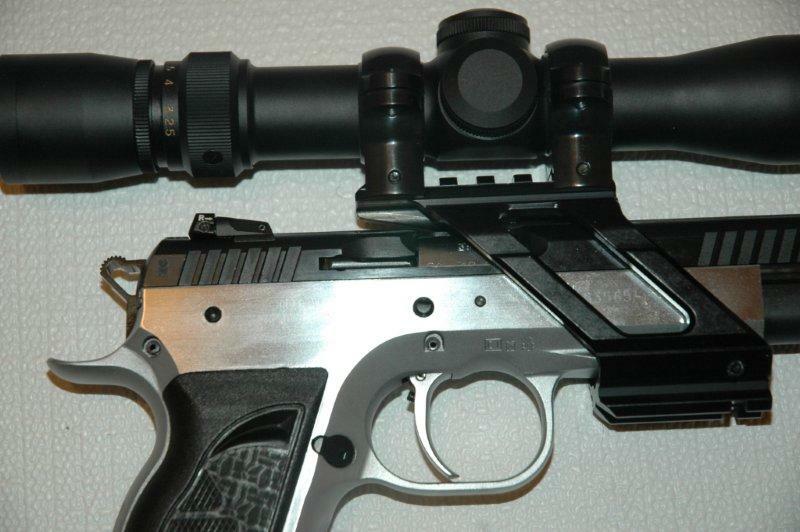 Almost all modern pistols have the top half (the slide) that cycles violently after a cartridge is fired, so mounting optics is actually not a trivial exercise. There are several super-light red dot sights, such as Burris Fast Fire series, that are very light and recoil-proof, and designed to be attached to the slide, but mounting even the lightest pistol scope to the slide is out of question. 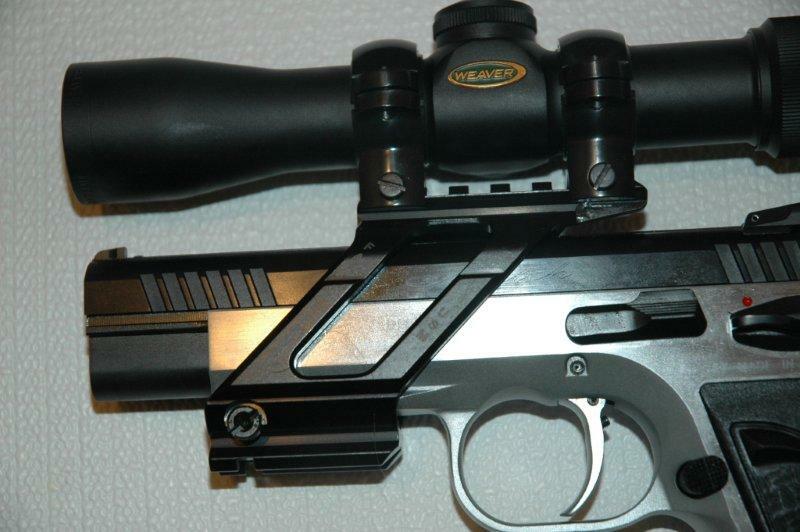 The slide movement would shake it off, and the added weight of the scope will interfere with the reloading action. 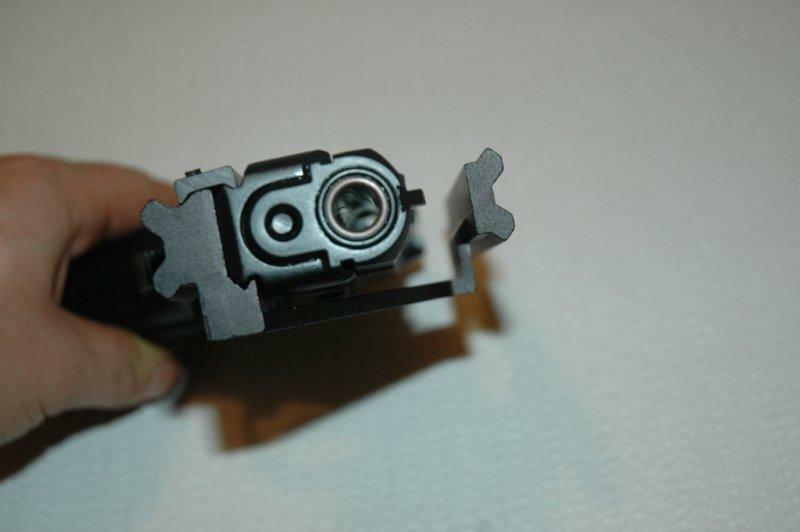 For this reason, vast majority of the optic mounting solutions designed for pistols attach to the frame. Some replace the grips, some require the metal frame to be drilled and tapped. 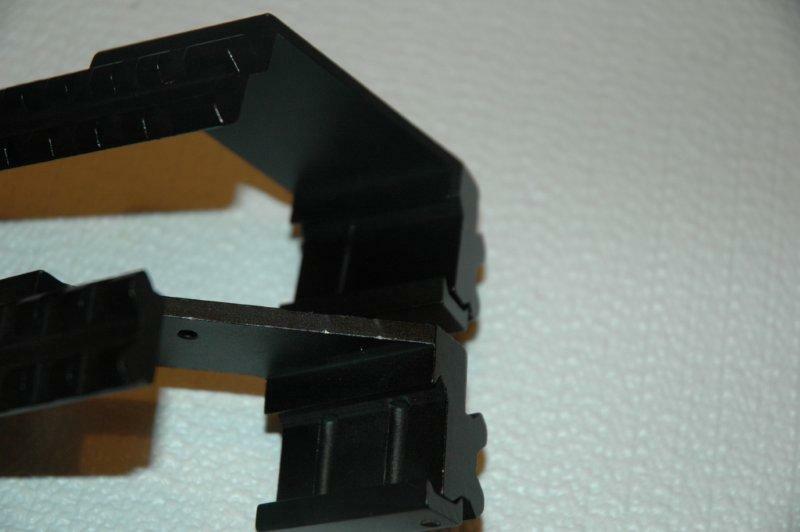 This article focuses on the scope mounts that are simplest to install - the ones that connect to the picatinny accessory rail under the barrel. 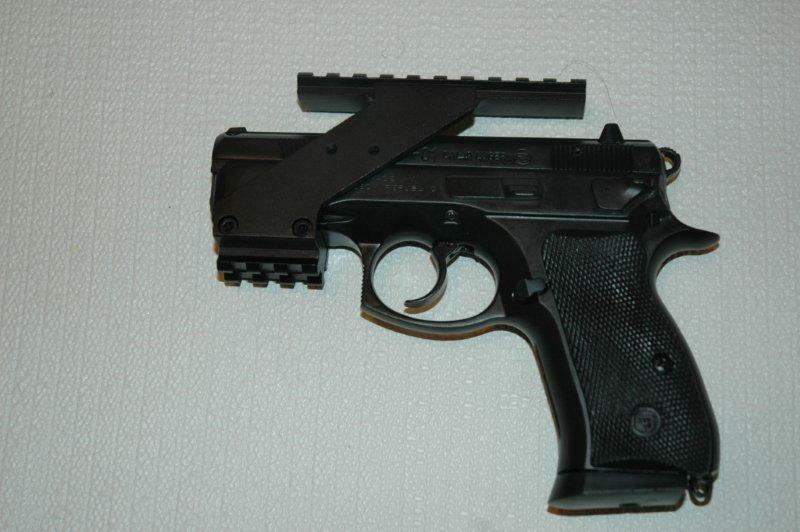 They do not require any modification to the weapon, and can typically be attached in minutes with just a screw driver. 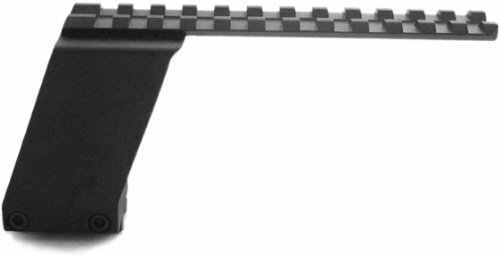 Finding pistol scope mounts is easy - just go to Amazon.com and type "pistol mounts". Great prices at our store! Deciding which one was worth buying is much more difficult. Reviews vary from mildly helpful to outright strange. 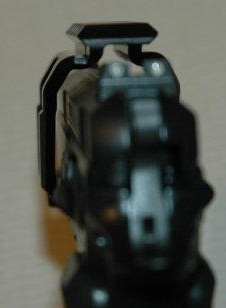 Many complained that the mount did not fit their specific pistol. 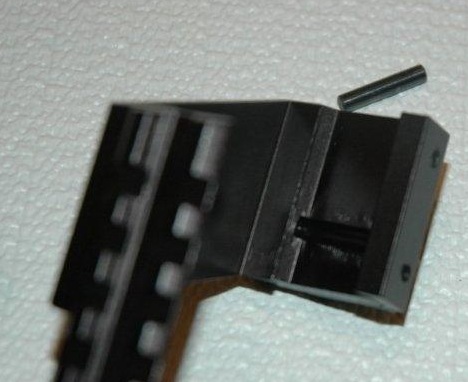 The more disturbing ones were about mounts biting into the slide under recoil and damaging it. 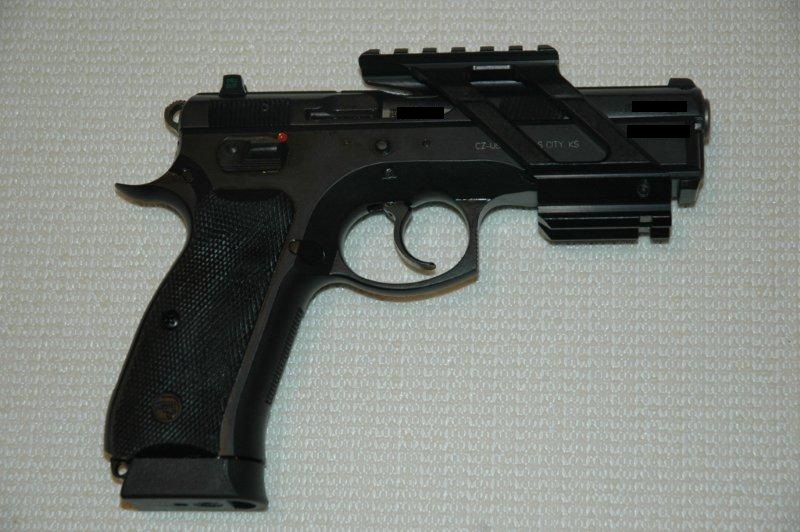 The scary part about these later ones is that we apparently have firearms in the hands of people who would shoot the pistol without as much as even looking whether there is proper clearance between the slide and the mount. After perusing the reviews, I just bought all types that were available. This is a cheap, most basic, no-frills solution. Made of aluminum with still stopper pin and bolts that pull the mounting bracket towards the base, thus locking it onto the pistol rail. ...and removed from its slot. 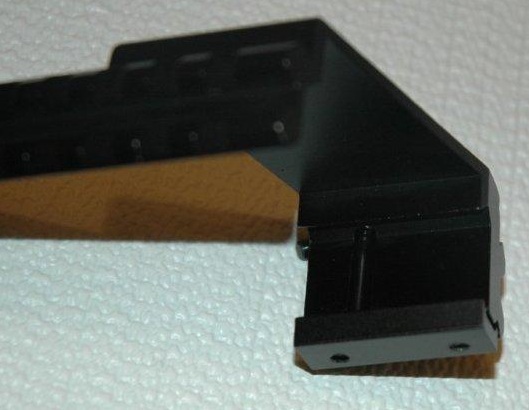 This is an OEM packaged NcStar mount, exactly the same as above, except it comes in a white box instead of a green one. No other differences. "UNIVERSAL TACTICAL PISTOL SCOPE MOUNT WEAVER & PICATINNY RAIL SIGHT LASER LIGHT"
Yes, this is the name for it. It is sold by LaSportsFans and I am going to be referring to it as LaSports mount going forward. This is essentially a clone of NcStar mount, done right. A Compaq to IBM PC, so to speak, if you're old enough to relate to this analogy. Here they are side by side. 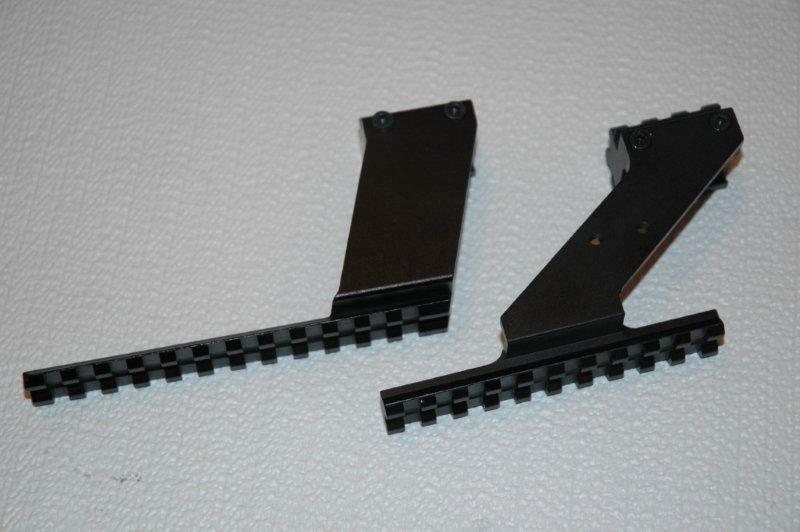 The rail is shorter and is attached to its "leg" at the middle, rather than at one side as is the case with NcStar mount. 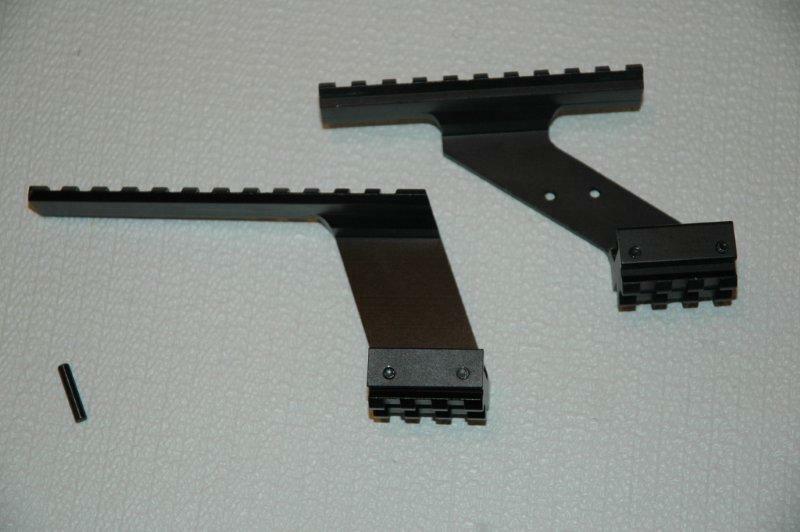 NcStar mount with its long rail all extended towards the back bends easily. LaSports mount also uses the steel pin to lock the scope in place, except it has two, not one groves, and the user can select which one to use. 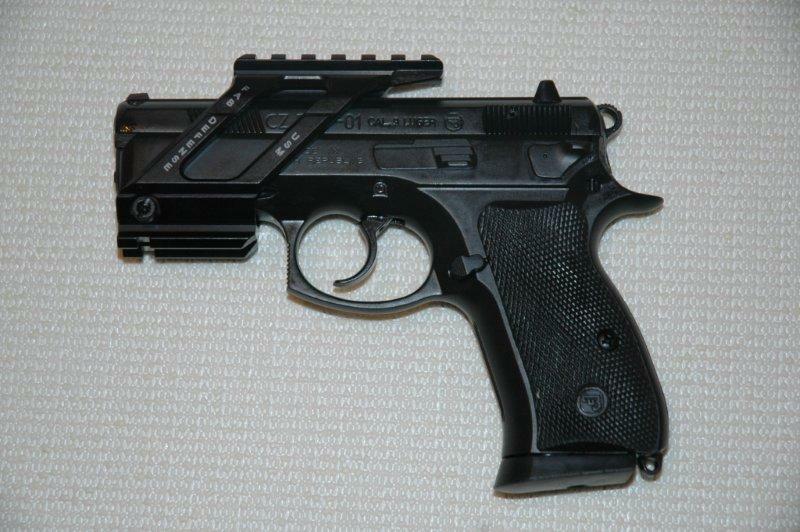 This makes it compatible with CZ 75 P-01 (see below). The mount I've got had a defect - the steel pin mentioned above was too long and prevented it from being tightened around the rail. This is a problem easily solvable with a simple file (or a Dremel), but you need to be aware of it. If you tighten the screws and the mount still wiggles around the weaver rail, remove the pin and see if this helps. If it does, shorten the pin and everything should work. I simply used a shorter pin from one of the identical NcStar mounts. 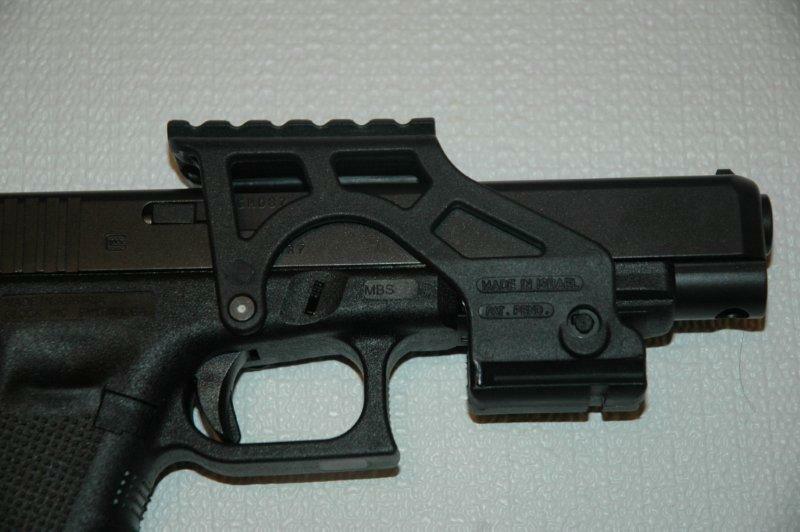 If this fits your pistol, it literally fits like a glove. This is also the most expensive solution, but when it works, as you can see below, it works extremely well, at least in some cases. This mount is made of polymer. It is not obvious from the product description. 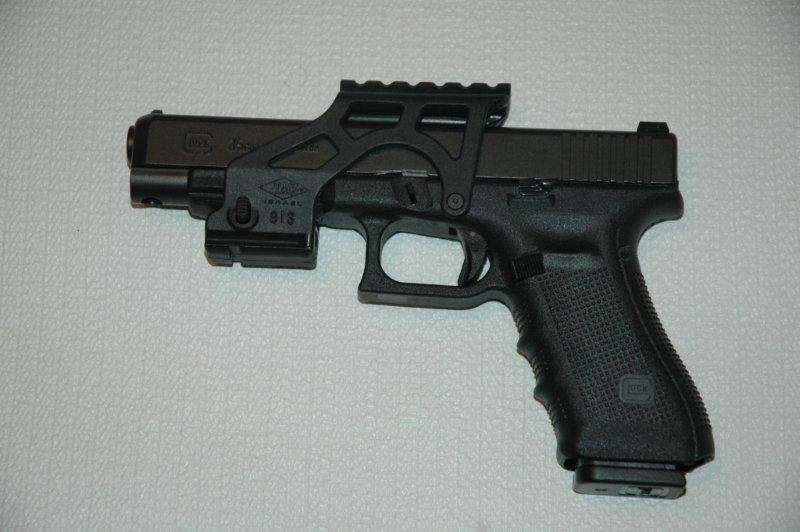 However, the polymer has the look and feel of a standard Glock frame, so it looks natural. As the name implies, the mount is made specifically for Glocks, and uses a comes with a special replacement trigger pin to which it attaches for extra stability. 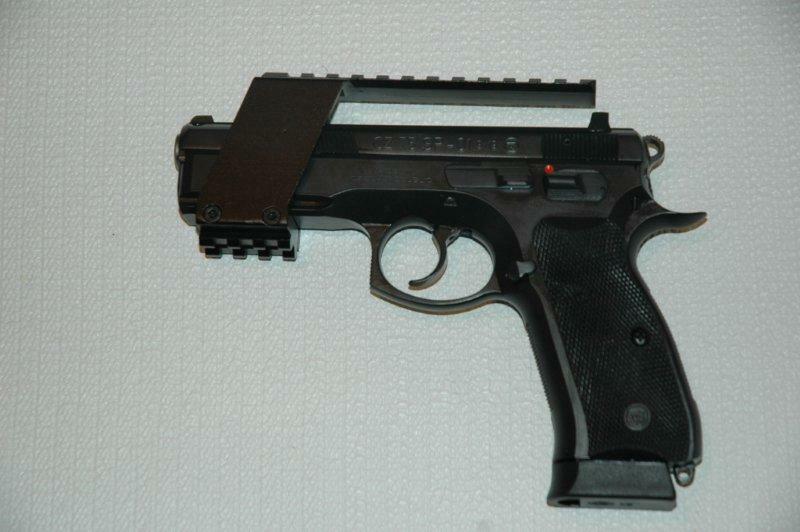 We have a number of pistols that come with an accessory rail out of the box. 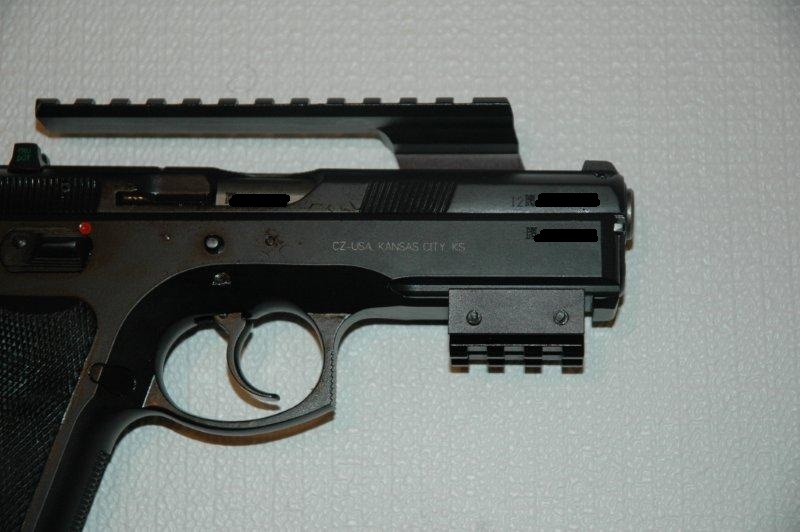 We tried the mounts on Hi-Point JCP, Ruger SR-22, Glock 35 Gen 4, EAA Witness Match, Sig P226, CZ75 P-01, and CZ75 SP-01. 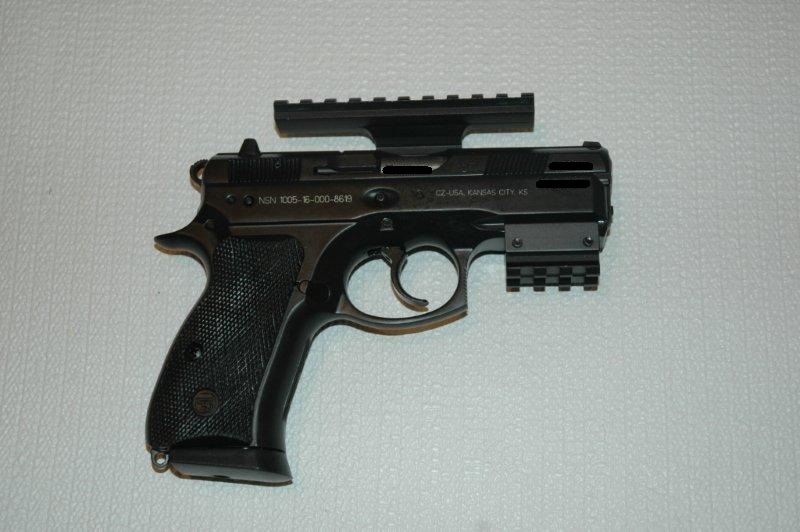 Of these, HiPoint, SR-22, and Glock had polymer frames, and the rest had either alloy (Sig) or steel frames (EAA and CZs). One of the hardest problems involved in installing a scope mount on any firearm is ensuring that it is collinear with the bore. On rifles receivers are usually aligned with the barrel quite well, and the problem of drilling the holes in it for scope mount is usually solved at the factory. But if you ever had to drill and tap the receiver yourself, or used a rail-mounted scope on an AK-47, you can probably relate to the problem. With pistols, it is worse. The mount is attached to the frame. The barrel is not. 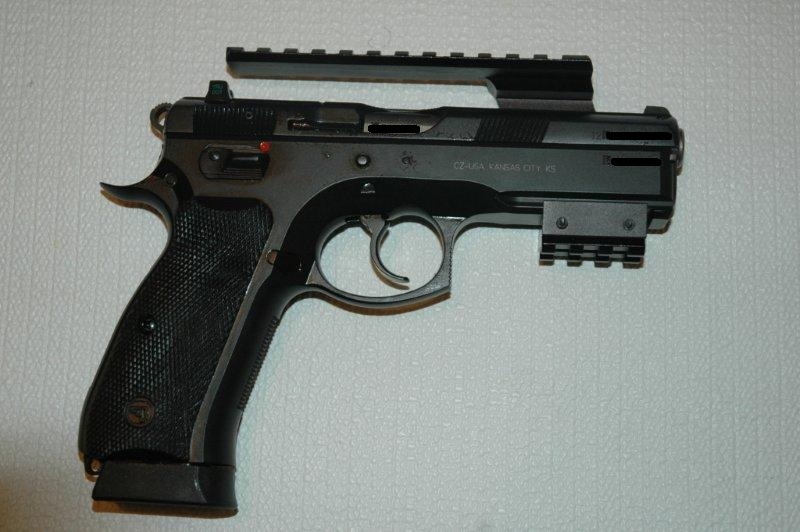 The slide holds the barrel in approximately right direction, but is not necessarily aligned with the frame, and where the bullet ends up flying depends on many factors - the springs, the guiding rode, and so on. 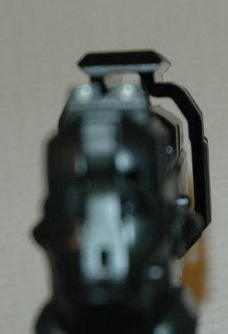 Even in accurate firearms, if repeatable, it is usually not exactly the direction of the frame itself. The mounts below are not magical, and all of them will require significant amount of correction before the scope can be zeroed. The amount of misalignment is usually far beyond what scope's internal mechanism can correct, so assistance from the rings will be necessary. Burris Signature Zee rings are very handy here. With two 20MOA inserts they offer up to 40MOA adjustment - in any direction - and I used it all to put the scope within zeroing range on a number of installations below. They are available in our store. All of the mounts allow using iron sights at the same time as the scope, and it allows for a quick and easy rough zeroing - train the gun on a spot using the iron sights, then steal a peek through the scope to see where the crosshairs are pointing. This should give you an idea of how much correction is required. Of course, a laser bore insert can be used as well. 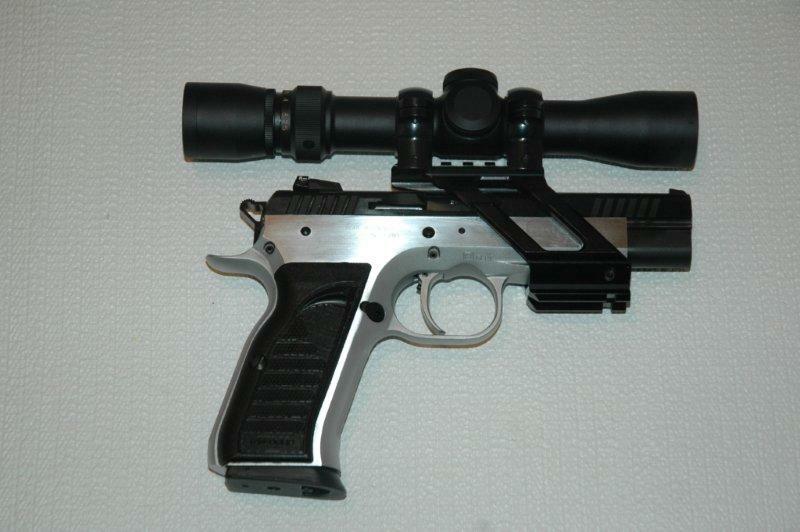 Unfortunately, none of the scope mounts worked on either Hi-Point or Ruger. 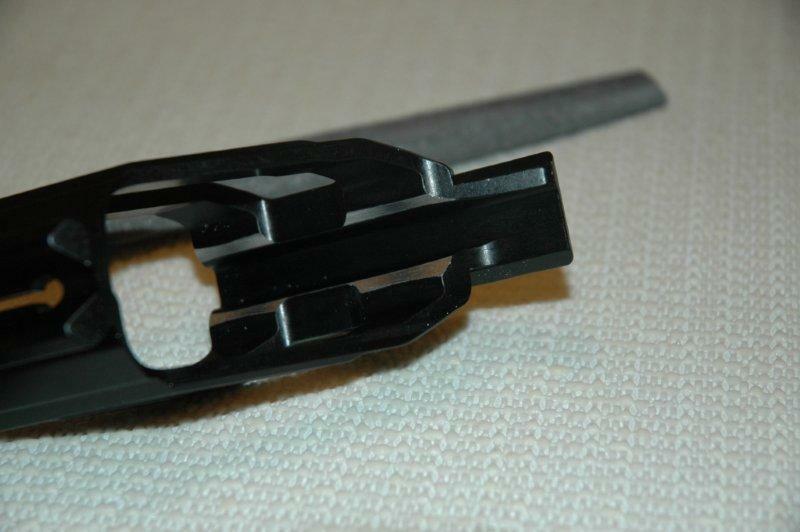 The polymer frame of Ruger is rather soft and thin at the barrel end where the rail is. It bends easily, and is simply not sturdy enough to hold rather heavy mounts in place, let alone mounts with the scopes. 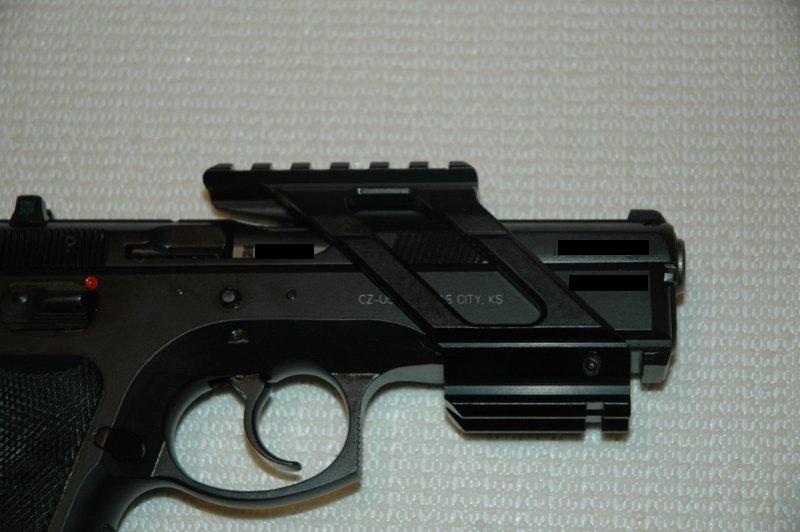 Hi-Point JHP also have the polymer frame that is not super hard and would have probably suffered the same problem as Ruger did - if any mount could have been attached at all. Unfortunately no scope mount was large enough to clear its oversized slide. 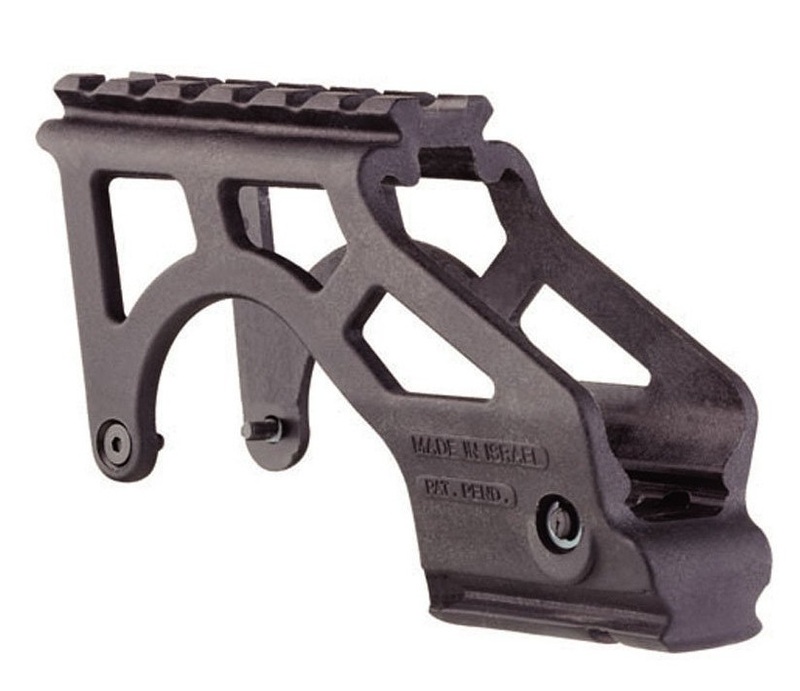 Glock's frame is also polymer, and when I attached NcStar mount to it the reason behind Mako's specialized Glock solution had become abundantly clear. The mount simply wobbled back and forth, flexing the whole front end of the frame. 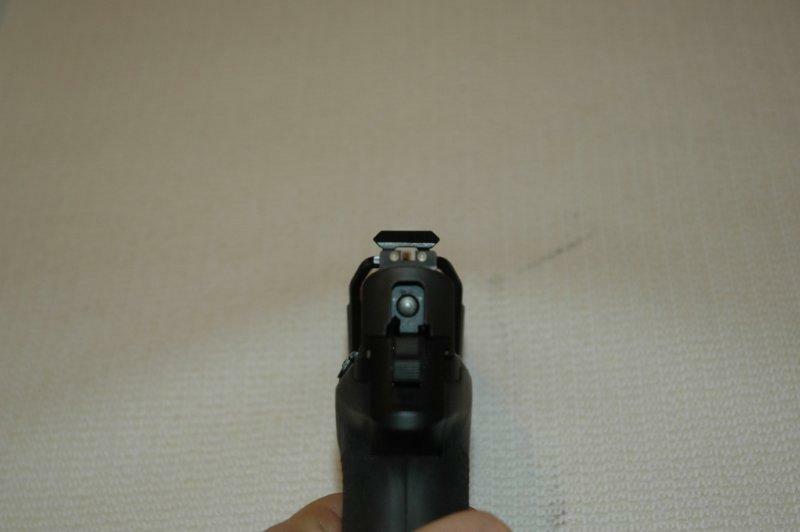 Installing Mako's Glock mount requires removing the trigger pin and replacing it with one provided with the mount. This pin has holes drilled at both ends with the screws that secure one end of the mount. Remove screws before installing it. It is easiest to push the trigger pin out with the help of the new pin. Wiggle slide stop and don't force anything - the original pin has grooves cut out where the slide stop engages it, and it just needs to be sort of rocked out. Make sure that everything in the trigger mechanism settles in place before installing the mount - reinstall the slide and try the trigger. 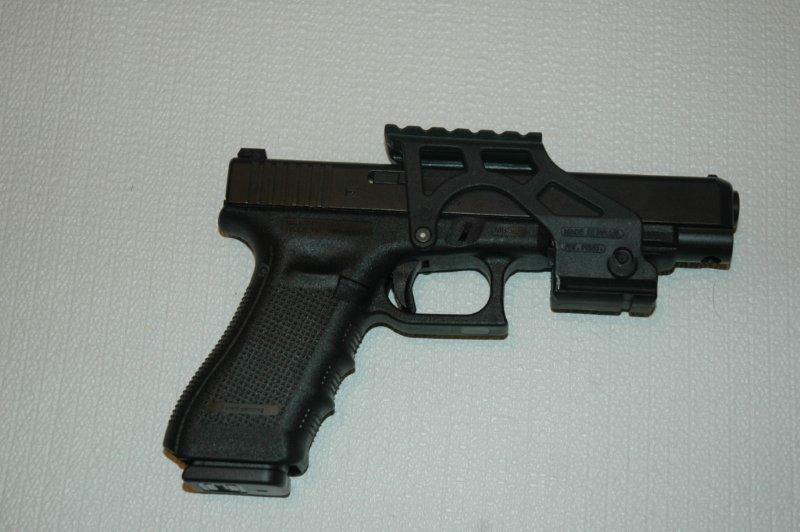 When I did it for the first time, my 3.5lb trigger in the competition Glock 35 model was somehow converted to 8lb pull. Removing and reinstalling the pin returned it back to where it was originally. I believe the mistake that I made the first time was not removing the smaller pin above the trigger. After the pistol function has been verified, pull the mount over the frame and secure it into the new trigger pin using the screws. Despite the mount being made from plastic, it is very sturdy. The triangular support gives it more stability than all other mounts, even though they are made of aluminum. 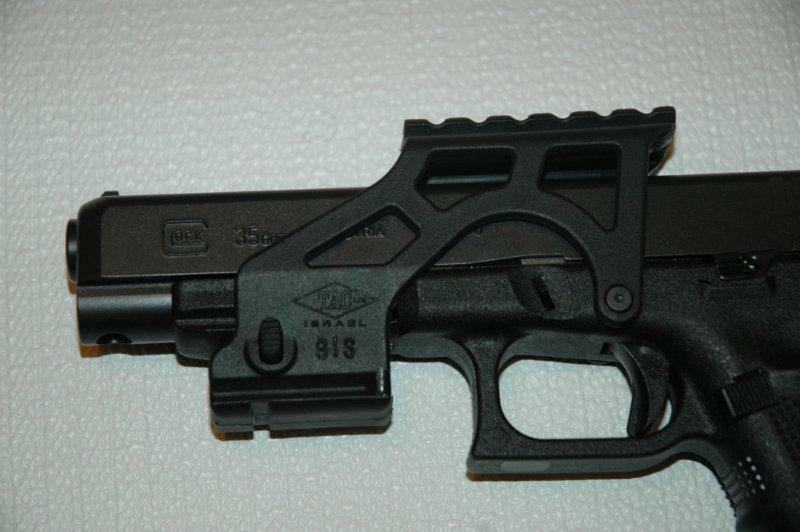 And since the polymer has the look and feel of normal Glock frame it blends into the rest of the pistol well. 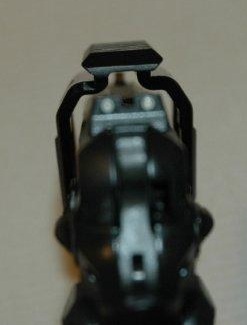 The iron sights can still be used with it, and there is enough clearance around the slide to not worry about it being damaged in operation. 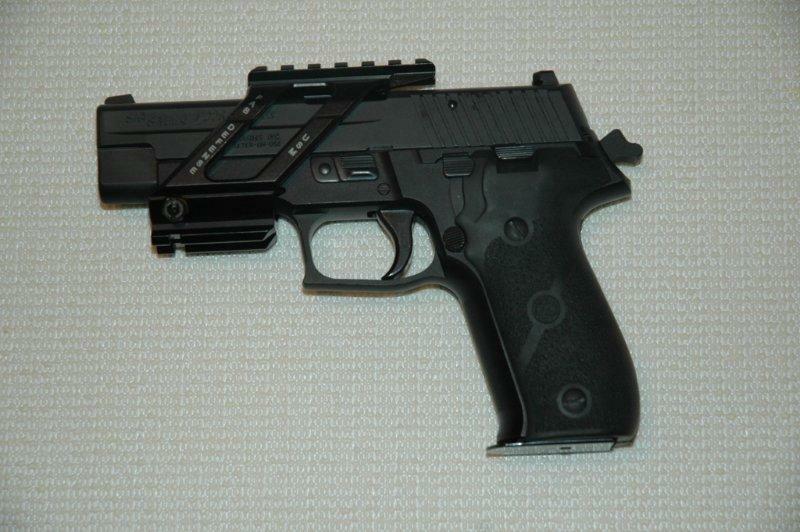 The only pistol that I had to work to fit it was Sig P226. It has a rather large frame, and though there was some amount of clearance between the slide and the top of the mount, it was just a fraction of a millimeter and I did not feel comfortable leaving it like this. So I used a large round file to take some material from the inside of the mount where the top of the slide could touch it. The file had curvature that was almost similar to that of the slide, so the cut it made nicely matched the slide. It took 3 filing-fitting cycles to get it just right, and about 20 minutes of total work. Just like with all the other pistols, the iron sights on Sig are still usable. 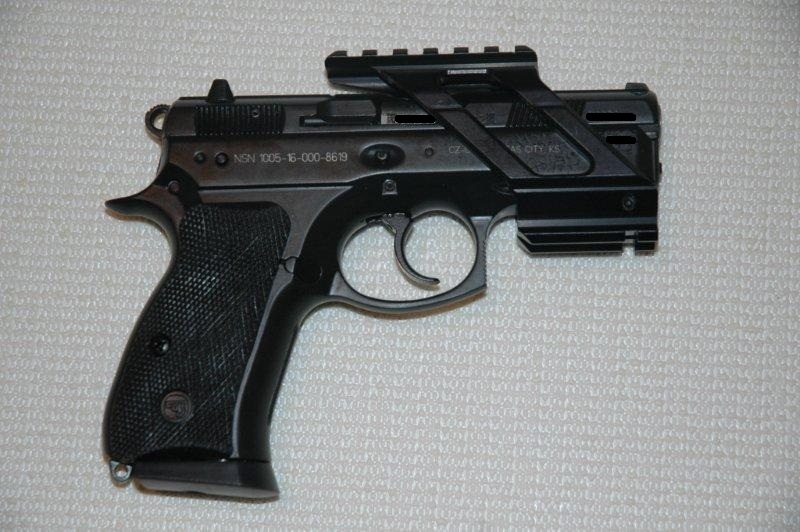 The LaSports mount worked well on CZ 75 pistols after the oversized pin problem was solved, and doubtless would have worked just fine with the EAA Witness. 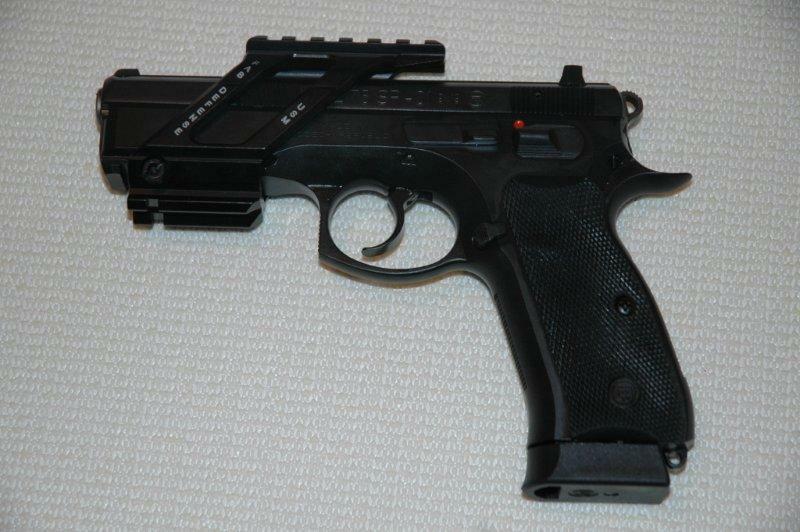 Here it is on CZ 75 P-01. To use it with P-01 I had to move the pin to the front groove, as the only groove on the rail on P-01 is very close to the muzzle. Note ample clearance between it and the slide. 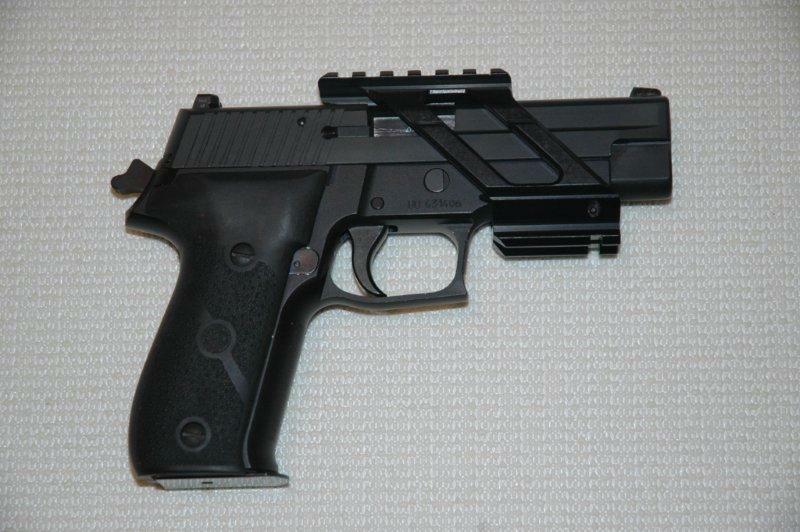 Sig P226 has a curved rail, and while the scope had enough clearance to install, I decided against using it on a Sig. However, if price is a big concern, it will probably hold, and if not, a groove can be filed into the bottom of the mount to provide better mating with the rail. 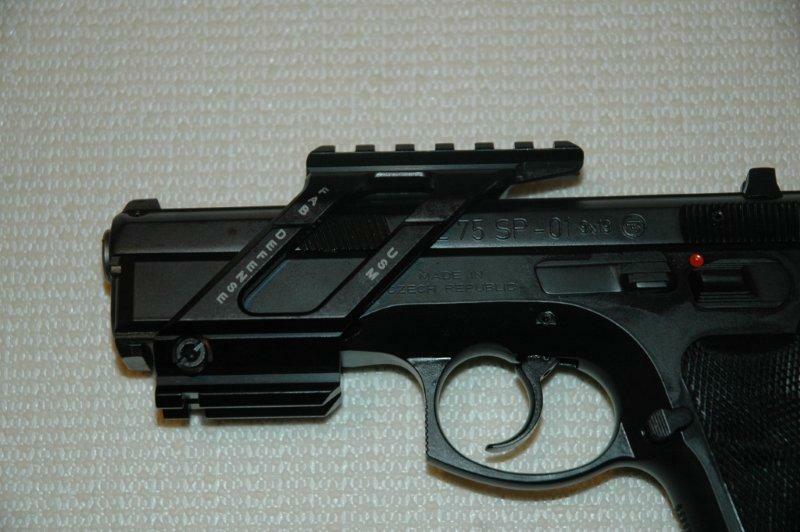 Because the NcStar mount has only one position for the pin that fixes the movement along the frame, and it is towards the rear of the mount, it cannot be used on P-01 at all, but works OK on SP-01, and would have similarly worked on EAA. It provides ample clearance between itself and the slide. 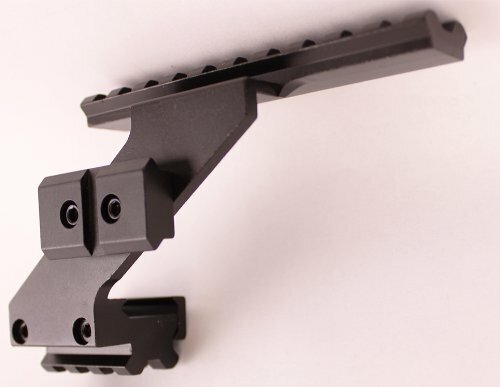 However, as I have already mentioned, because the rail is long, thin, and is extended to one side of the holding arm, it bends easily, so the setup is not very rigid. For this reason I do not recommend NcStar mount for any pistol. You get what you pay for. With the exception of Mako Glock mount which is the only suitable option for Glocks, the desirability of the rest of the lineup ranged strictly by price. 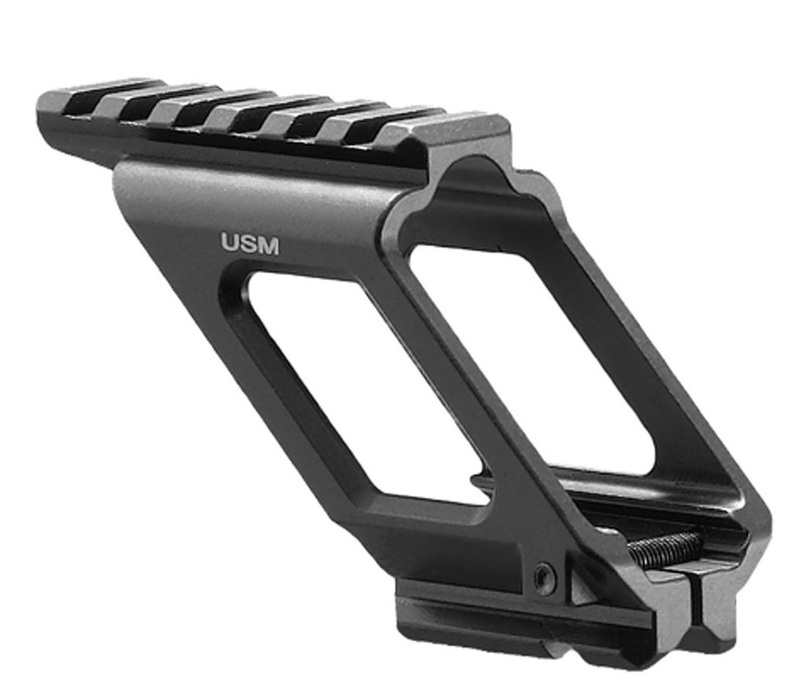 Mako universal mount was the best, it worked well on the largest number of pistols, and at the same time it was by far the most expensive option. The next best, and the next most expensive option was the mount from LaSports. The cheapest NcStar and its still cheaper OEM version cannot be recommended at all.